Last week, while I was on Thanksgiving break, OMD dropped the sort of bomb that we take notice of, even across the Atlantic. I suppose I should have expected this, as the band have weathered the 2013 heart attack of drummer Malcolm Holmes by only playing three shows so far. Now there will be a fourth, and it’s a corker. 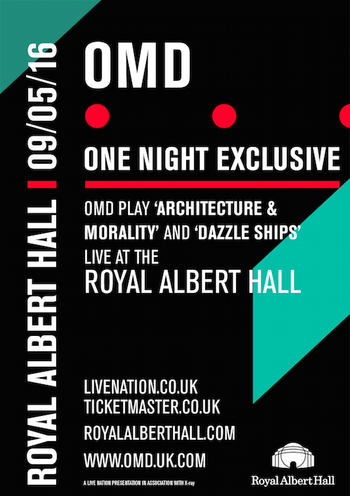 Next May 9th, OMD [with interim drummer Stuart Kershaw] will perform a one-off show at the Royal Albert Hall with the first half of their set being the entire “Dazzle Ships” album, and the second half being their most successful “Architecture + Morality” album in its entirety. The band teased a dazzleshow with their benefit concert for the Museum of Liverpool in 2014, but that only saw a handful of the tracks performed live; some for the first time ever. Now that Andy knows that after years of naysaying, he has actually managed to perform the incredible song “International” live once, and he’s betting on a second time. The show begins at 7:45 and tickets for this event are priced appropriately from £32.50 [$48.77] to £55 [$82.54] for seating to go on sale at 9 a.m. GMT on Friday, Dec. 4th. Click here to purchase/get details. If you want the V.I.P. ticket treatment [as if seeing the band in the RAH were not posh enough] forget it. You’re too late. The £150 [$225.10] and £250 [$375.16] gold and platinum packages are long gone. Ouch! Though I suppose if I were in clover enough to be jetting across the big drink for a concert, it would be all or nothing and I would have ponied up. Being that this monk has taken vows of poverty, I have to content myself with fond memories of the only V.I.P. gold I ever indulged in during the band’s triumphant US tour of 2011. Fond memories, indeed! Though I hasten to point out that it only cost me $150 [£99] for the Full Monty at that time. This entry was posted in Core Collection, Designed By Peter Saville, Organ Auction Live Event and tagged 2016, Concert, OMD, Organ Auction Live Event. Bookmark the permalink. This would be the perfect OMD concert in my mind. The two albums of theirs that mean the most to me. Echorich – Close. My number one is still “Organisation.” These would be two and three, respectively. Still, it could be yours… if the price is right. We should all be boarding planes for this one… a PPM contingent. Brian – Where’s that venture capitalist when we need one? Barring that, does anyone have a garage full of candy bars to sell? We’d have to sell a lot of chocolate bars to charter a cross-Atlantic party plane, but I would volunteer to do the legwork of someone would front the capital!